The majority of Moroccans are Sunni Muslims of Berber or mixed Arab-Berber descent. Berbers have lived in Morocco for at least 5000 years, but Arabs dominated the territory that would become Morocco in the 7th and 11th centuries, building the foundation for the emergence of an Arab-Berber culture. A part of the populace is regarded as Haratin and Gnaoua, black or highly mixed race Moroccans. Morocco's Jewish minority has shrunk to about 7,000. Most of the 100,000 foreign residents are Spanish or French, generally colonists' descendants who are mostly professionals under the employ of European multinationals. 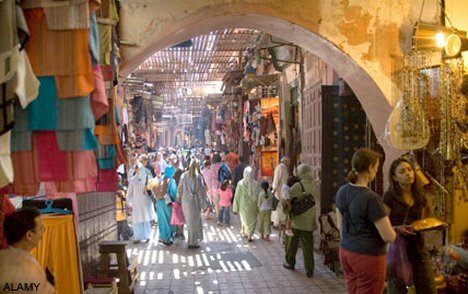 Morocco's population was estimated at 30,122,350 in July of 2000, an increase of 1.2 percent from the 1990 population of 24,043,000. In 2000, Morocco's birth rate stood at 24.6 births per 1,000. More recent estimates place the population at about 32 million. Morocco is situated in the northwestern corner of the African continent, bounded by the Mediterranean Sea to the north, the Atlantic Ocean to the west, and Algeria to the east and southeast. The Strait of Gibraltar segregates Morocco from Spain at its northern tip, and its southern border is the Sahara Desert. Morocco's capital city, Rabat, is located in the northwest of the country overlooking the Atlantic Ocean. Other major cities are Marrakech in the center, Casablanca on the Atlantic Ocean, and Tangier in the north, on the Strait of Gibraltar. 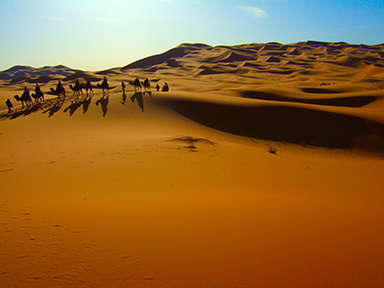 Morocco's geography spans from the Atlantic Ocean, to mountainous areas, to the Sahara desert. Morocco is a Northern African country, bordering the North Atlantic Ocean and the Mediterranean Sea. 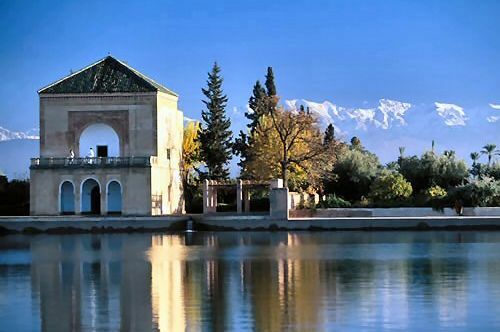 Morocco's climate is Mediterranean, which intensifies towards the mountainous interior areas. The coastal plains are rich and fertile, and the location for most of the agriculture. Forests cover about 12% of the land, while arable land accounts for 18%, and 5% is irrigated. Soaring over complex streets and markets of Marrakech is the city's primary landmark, the minaret of the Koutoubia Mosque, known as the "mosque of the booksellers" because of the bazaar of book traders that used to be nearby. The red stone mosque was first built in 1147, but was demolished and rebuilt in 1199 because it was not properly aligned with Mecca. Though it may not be a thing of beauty, the large town square of Marrakech, Diemaee el-Fna (Square of the Dead) makes up for it through the exciting liveliness that belies its name. Each day, the square is a colorful circus of performing artists, where snake charmers, musicians, storytellers, and healers vie for the attention of the crowds. The Saadian Sultan, Ahmed el Mansour, built this stunning necropolis in the late 16th century as a final resting place for him and his successors. There are 66 indoor tombs, prolifically decorated with colorful, elaborate mosaics. Islamic forces occupied the area in the 7th century, and this led to a power struggle between diverse groups lasting for several centuries. The powerful Alaouite Dynasty then gained control of Morocco after a long series of Civil Wars. Under their control, Morocco was the first nation to recognize the United States in 1777. During World War II, American forces landed in Vichy French dominated Morocco, and this was the location of the first conflict between American and Axis forces. In 2006 the African nation of Morocco celebrated its 50th anniversary of independence. Today it is a country endowed with rich culture, due largely to its strategic location and long history. 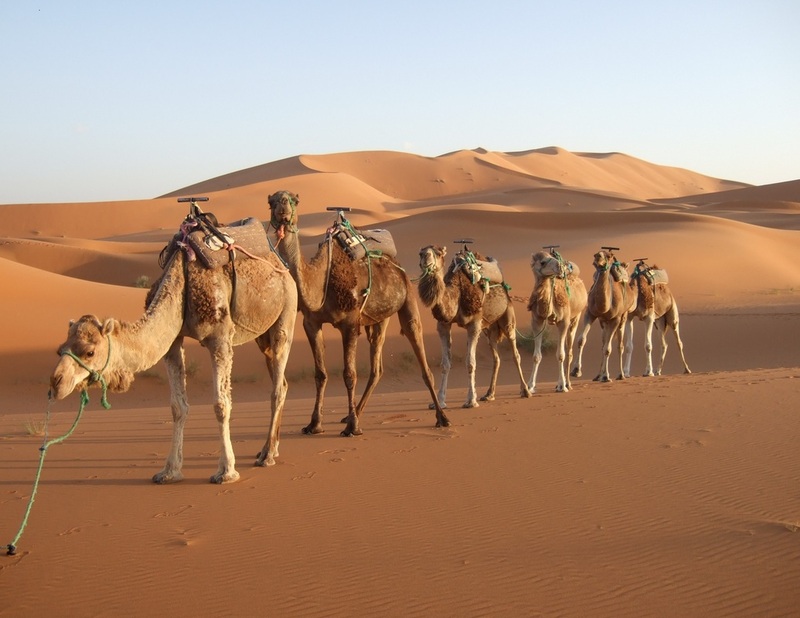 Morocco is a country of many ethnic groups with a rich culture and civilization. It has been home to many people in addition to the indigenous Berbers, coming from East (Phoenicians, Jews and Arabs), South (Moors and Sub-Saharan Africans) and North (Romans and Vandals). All of these have had a powerful influence on the social structure of Morocco. Each region has its own identity, contributing to the national culture, but Morocco has set among its top priorities the protection of its diversity and the preservation of its cultural heritage. Morocco is a predominantly Sunni Muslim country, with Christian and Jewish minorities. The official language is Moroccan Arabic, but French is widely spoken throughout the country. 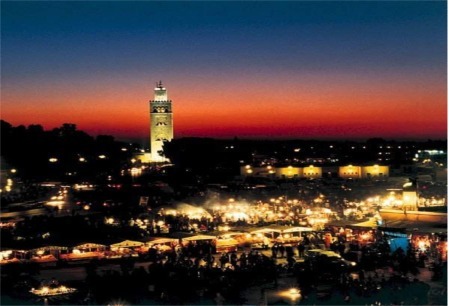 English is also understood, especially in the north and in major tourist destinations like Marrakech. The nightlife of Morocco is lively and energetic, offering different diversions each night, including bars, discos, and restaurants, often with live music or belly dancing as part of the evening's entertainment. The party usually starts around midnight, when dining tables are shoved out of the way to accommodate some serious hip shaking, and the partygoers make their entrance to the nightclubs. There are also casinos in Marrakech, Mohammedia, Tangier and Agadir, but such high-stakes entertainment can't compare to the cheap, fantastic, thrills of halqa, the street theater performances by acrobats, musicians and cross-dressing belly dancers who perform for money in the city squares across Morocco. Moroccan cuisine is reputed to be some of the best in the world, with numerous dishes and variations proudly bearing the country's colonial and Arabic influences. Most restaurants serve dishes foreign to Morocco, since Moroccans can have their domestic dishes at home. Outside of major cities, Moroccans do not normally eat out in restaurants, so options are generally limited to international fare such as Indian, French and Chinese cuisine. - is the staple food for most Moroccans, and it is probably the best known Moroccan meal. It is made from semolina grains steamed in a couscoussiere, a double boiler also used to make rice. Couscous can be served as an accompaniment to a stew or mixed with meat and vegetables and presented as a main course. - is a spicy stew of meat and vegetables, simmered for many hours in a conical clay pot. Variations include chicken tagine with lemon and olives, and fish or prawn tagine. - is a popular Berber contribution to Moroccan cuisine, made from a combination of lamb, tomatoes, bell peppers and onion and served with couscous or bread.